(1) Phytosociological study for understand of the regional vegetation. (2) Creation of native forest by potential natural vegetation theory. (1) Hayashi, H., Y. Murakami and T. Yagasaki. 2003. Study for ordination of regional vegetation by degree of succession ?A case study on vegetation of western Takefu City, Fukui prefecture, JAPAN. Eco-Habitat, 10(1):57-76. (2) Hayashi, H., Y. Murakami and T. Yagasaki. 2005. Spring plant communities in two areas of Fukui prefecture, JAPAN. Eco-Habitat, 12(1):107-121. (3) Hayashi,H., S.Meguro, K,Fujiwara, S.G.Mathenge, T.Furukawa and A.Miyawaki. 2006. Primary study of dry forest vegetation around Nairobi City, Kenya. Eco-Habitat, 13(1):23-32. 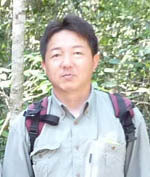 (4) Hayashi, H. 2007. Fire-preventive function of trees in urban disasters. Eco-Habitat, 14(1):57-64. (5) Hayashi,H., S.Suzuki and T. Yagasaki. 2008. Growth of root sprouts in Akamegasiwa(Mallotus japonicus) after forest fires. Eco-Habitat, 15(1):43-48. (6) Hayashi, H. 2009. Statistical data on water content ratio of tree leaves. Eco-habitat, 16(1)：71-75. (7) Hayashi, H., M.Shinohara, S.Matsushima and K. Fujiwara. 2010. Basic experiment on windbreak effect of trees ?Comparison with combination of tall trees and shrub trees-. Eco-habitat, 17(1)：81-94. (8) Hayashi, H., M.Shinohara, S.Matsushima and K. Fujiwara. 2012. Experimental investigation of the effect of trees near flame to reduce the received heat radiation behind the trees. J.Jpn.Soc.Reveget.Tech.,38(1)：33-38. (9) Hayashi,H., S.Kim, P,Pak and A.Miyawaki. 2012. Restorative activities of nativeforest in Cambodia. Eco-habitat. 19(1):73-85. (10) Hayashi,H., S.Suzuki and T. Yagasaki. 2013. Growth Behavior of Fifteen Broad-leaved Tree seedlings for Eleven Years at Hakone POLA Museum. Eco-Habitat, 20(1):25-35. (11) Hayashi,H., M.Shinohara, S. Matsushima and K. Fujiwara. 2015. Experimental Study on Burning Behavior and the Heat-Shielding Function of Trees against Flames under Windy Conditions. Eco-Habitat, 21･22(1):43-56. (12) Hayashi,H., M.Sakurai and A. Kanazawa. 2016. Seasonal Changes in Leaf Water Content Ratio of Machilus Thumbergii Exist in the Northern Limit of the Pacific Side of Japan. Eco-Habitat, 23(1):41-49.